Reading code that is formatted and color coded looks better and is easier to read. Jenny Watson wrote a blog post a while back on the topic, which you can find here: Coloring code in Flare with Prettify. We have taken what Jenny wrote and expanded on it a bit to give you a step-by-step process to get this to work in any topic with code samples in your project. Thanks for giving us a head start on this one, Jenny. Note: This only works in HTML5, WebHelp, WebHelp Mobile, CHM, and DotNet outputs. 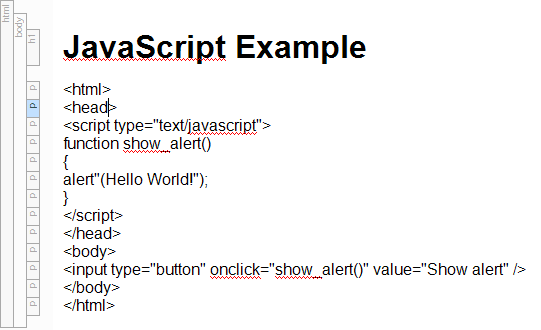 Also be very careful with the typed code as the script is very case sensitive. 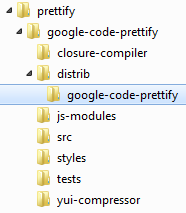 Download the Prettify tar file from Google and unzip it (Winzip or WinRAR should work). In your Flare project, paste the files into the Resources folder (in this example we created a prettify subfolder under Resources). 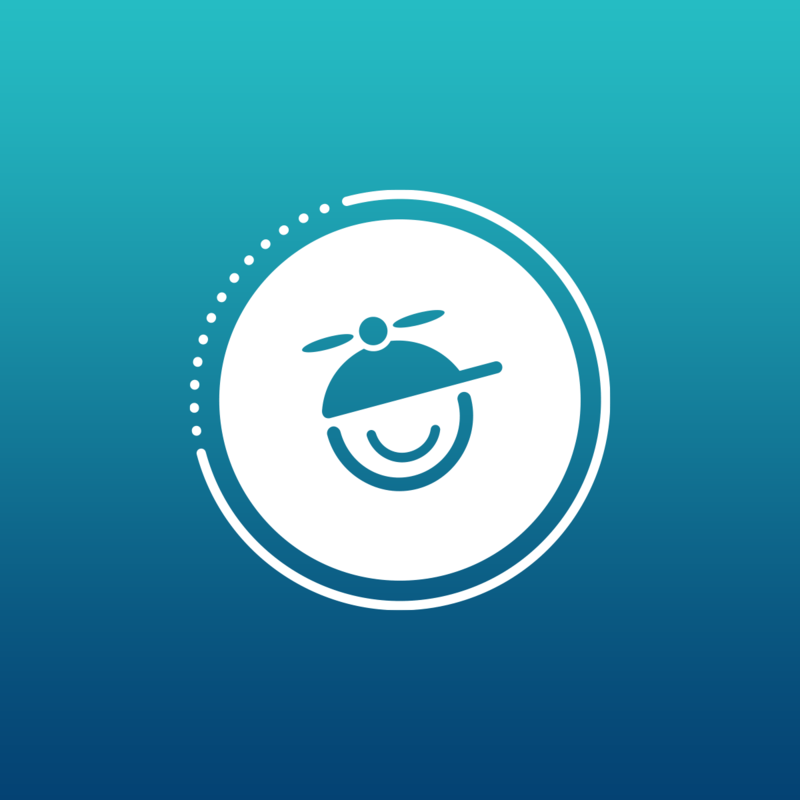 Create a 1×1 transparent .png named onLoad.png and copy it to the prettify folder. If you don’t want to create one, download this one, unzip it and copy it the prettify folder that you created in step #3. 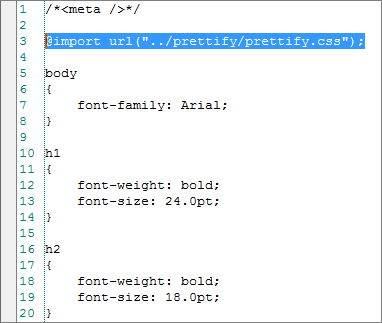 Add “@import url(“../prettify/prettify.css”);” before the first style. If you you are using a Master Page in your project for your outputs open it in your editor, if not create one and add it to your ‘online’ targets that you want Prettify to work with. In the Master Page editor, add the onLoad.png that was created or downloaded earlier. We would suggest adding it to the very bottom of the Master Page so that it doesn’t affect an content and Save it. Open the topic that you want the code to be in and type it in. Since the “code” is wrapped in a pre tag you can now insert spaces to indent the lines of code. This can be done in the text editor or in the regular topic editor. You should now be able to generate your online outputs and see the code samples formatted and in color. If you want to see the sample project that we put together for this, download it, unzip it and open it in Flare V8 (it is a Flare V8 Project so it cannot be opened in older versions). Hi – Thanks to Jenny and Madcap for this article. We have used another solution but it is good to know we have an alternative. PLEASE could someone find a way to include syntax highlighting in a PDF output? We publish many of our developer docs as PDFs. We want to be able to cut and paste from the PDF and use the code – but to still have it display in colors. I am not sure if this is feasible, but it would be great if it could. How do you put a mixture of source from different languages in the same topic? Make sure that you just include it in a pre and style it the same way as the example (class=”prettyprint”). Check out the sample project included in the post, copy the pre from each of the sample topics and paste them into the same topics. If you compile at this point you can see that they all are color coded. I followed the exact steps to apply the prettify js, but I can’t get the code colored. It is placed in a rectangle, formatted correctly, but not colored… any ideas? The code will not be in color in the editor, only in the generated output (not print). Try the sample project and see if that works for you. If it does, then there probably is a case issue in your code. The script is VERY pick about case. We had the same issue when we were messing with it and found that we capitalized something when it was supposed to be lowercase. Do you think Highlight.js (http://softwaremaniacs.org/soft/highlight/en/description/) would also work? Anyone that gets other examples up and running, please let us know, or share your examples! One alteration to the steps in the post though: When you come to search&replace tspan. in lines containing that and } – remove only the “t”. Otherwise pasting those lines into your .css file won’t create styles in Flare. But the local output worked for me in html as well as pdf output! The instructions are out-of-date for the current version of prettify. The script example was removed from the previous post. You need to link to the script ‘run_prettify.js’ – instead of ‘prettify.js’.